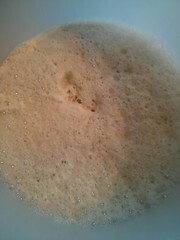 Bottling this proved to be a bigger challenge than I had anticipated. I ended up with a lot of trub (the technical term for the dead yeast and hop debris at the bottom of the fermenter) in the bottles, and I tried to pour the beer from the 1-gallon carboy in to the bottles, using a funnel. Big mistake. 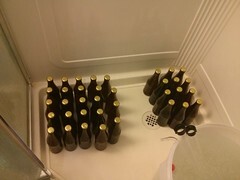 I’m fairly certain I ended up wasting half the batch, and the bottles have way more trub in the bottom than I would like. 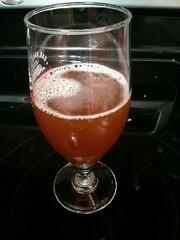 Flavour-wise, the beer came out nicely. 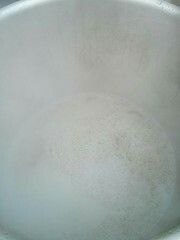 The hops came through brilliantly, although with age the flavour has dulled a bit. The colour was a bit odd – I was expecting a fairly light colour, but it ended up a reddish-brown. Still, a great first experiment with all-grain. 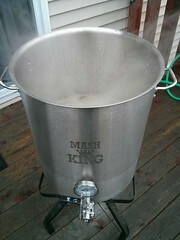 Seriously considering taking another stab at it, after I finish the Brew House Pale Ale kit I started a few weeks ago. Speaking of which, I decided to hack this kit, like I hacked the last one. 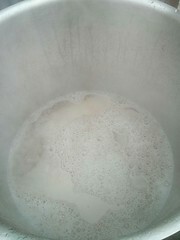 This time, I decided to dry-hop it – twice! 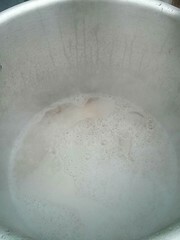 I added an ounce of Cascade hops when I first started, and another ounce about two weeks ago. I’m very curious to see what the results are. The weather has warmed up enough to start doing cold coffee again. I didn’t realize just how much I missed it! Despite the late start to the season, the garden is on a roll. In addition to the 3 raised beds, I’ve got a couple of window boxes set up on the deck with herbs, including several that I purchased from Richters Herbs. I organized a few folks here in St. John’s to do a group order, so that we could split on the shipping, and for the most part it worked out very well. I’m thinking of doing it again next year! I also purchased a “North Star” sour cherry tree, as a Father’s Day gift to myself. There’s a lot to learn about pruning and the like, but it seems like a lot of fun. 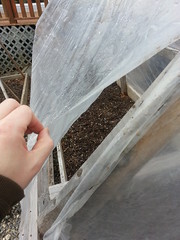 I’ve been giving some thought recently on how to extend my season, in no small part thanks to a workshop put on by Dan Rubin of Perfectly Perennial that I attended back in April, and have been sketching out a few ideas on how to build some cold frames, as well as a greenhouse. All of my designs have gone through several iterations, but I think I’ve got a good handle on them now. My main goals are to make them as simple as possible, keeping in mind the tendencies of my yard in the winter. 2 Responses to "Full Belly Fridays: Updates And More"